She wanted to be just like Mary Lou Retton, but at 6'4"- 220lbs, the throws seemed to be a better fit. After being only the 3rd qualifier at the U.S. 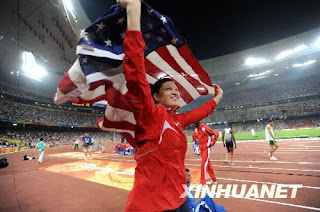 Trials, Brown Trafton dreamed of medaling in Bejing, but was not expected to, the win is remarkable. The winning throw came on her first attempt in the finals and it just put to much pressure on the field, they could not surpass her. 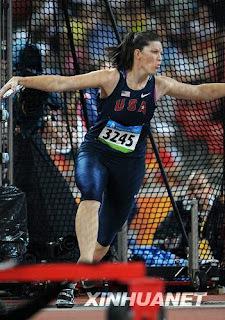 She is the first U.S. woman to win Olympic Gold in the discus since Lillian Copeland in the 1932 games.